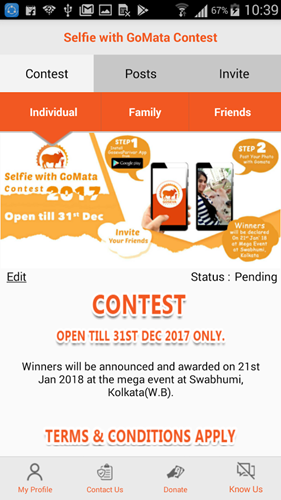 Cowfie contest that is take a selfie with Cows and win Prizes, yes there is an Android application which allows you to win prizes by uploading a selfie with cows. The application is GoSeva Parivar (Go- Cow, Seva- Service, Pariwar – Family) developed by a Kolkata based NGO. You need to Download the application from the play store (link here) and register the application with your mobile number. 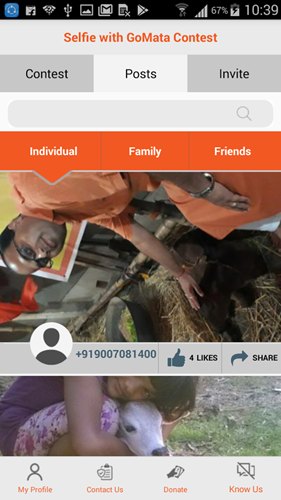 After that you need to upload a selfie with cow (the application page says “Take a selfie with only Desi Cow or Indian breed cows.”) to the appropriate category to earn Goseva points. 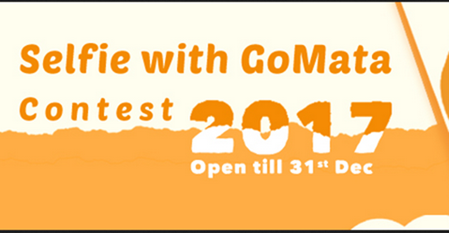 You can also earn more Goseva points by inviting your friends. Each friend who joined via your invitation will get 100 points while you will get 50 points. Those who have the highest points will e the winner. Best photograph in each category also will be receiving prizes. The last date to submit your entries are on 31 December 2017, and the Winners will be announced on 21 January 2018. We do not know what are the prizes offered. They have conducted a similar contest in 2015 in which more than 700 people participated. Recently cows was in the main news sections in India due to the Cow rakshak, Cow slaughter ban etc. Abishekh Pratap Singh, an official of the NGO said this application was getting good response when the cow slaughter and other issues are in News. He also said “The contest and the campaign will educate people on the economic and medicinal benefits the cow has and How to raise awareness against cow slaughter”. Win prizes by posting cowfie, a selfie with cows.